The San Antonio Not-for-Profit Wage and Benefit Survey is part of a continuing effort to provide support to the not-for-profit agencies of San Antonio. Werling Associates, Inc. has conducted a not-for-profit survey since 1998. Last year’s survey included data for 109 jobs from 93 agencies. The final report of the survey includes a thorough analysis of job-specific compensation data, thus providing organizations the information necessary to make reliable and equitable financial decisions. HOW CAN MY ORGANIZATION PARTICIPATE IN THIS YEAR'S SURVEY? Due to the change in funding there is a cost to receive the survey results. To purchase the survey, complete the Order Form and mail or fax it to Werling Associates, Inc., or email it to christy@werling.com. The final report and an invoice will be sent to purchasers on June 28, 2019. Participation does not create an obligation to purchase the survey results. 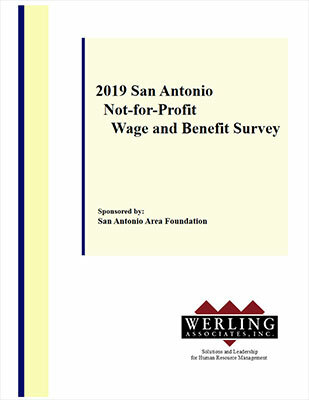 Werling Associates, Inc. would like to thank the San Antonio Area Foundation for sponsoring the 2019 San Antonio Not-for-Profit Wage and Benefit Survey.